"But I think it's interesting how in our sport, in our times, how someone can make that sort of dramatic change. But for someone who ran 10.00 seconds and now they are talking they can run 9.4 seconds the next year, it just boggles the mind. 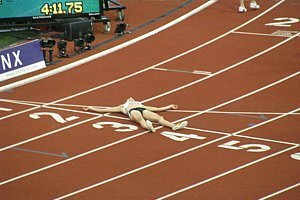 I was in Osaka (for the 2007 World Championships) and I saw the 200m. I saw Tyson Gay just drill him (Bolt) and one year later he (Bolt) breaks the world record. Wow, that's a huge improvement in a year. And in the 100m it's gone from ten flat to nine seven. It's a huge improvement." - Former track and field great Carl Lewis throwing mud at Usain Bolt once again. Carl, you were one of our all-time favorite athletes in the sport, but we suggest you pay a bit more attention. Bolt ran 20.13 at 16 and 19.93 at age 17. 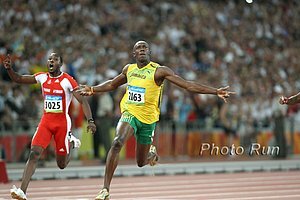 The 10.03 that he ran in 2007 was basically the first 100-meter race of Bolt's life. Great Article On Nate Jenkins From Running Times We read this in print a while ago and liked the article. Jenkins is known for his incredible work ethic and durability. 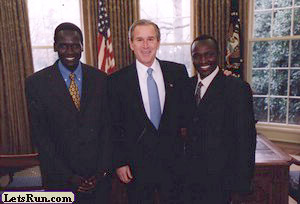 His work has paid off with a 7th at the 2007 Olympic Trials and a spot on this year's USA World Championships Marathon Team. If you're looking for training advice, we'd say Jenkins' biggest weakness is not allowing himself to recover, but his persistence and toughness make anything possible.